Safe staffing levels of nurses will soon be mandatory in Welsh hospitals, including an allowance to cover absences for holidays and sick leave. But are there enough nurses to go round? Statutory guidance published this month by the Welsh government and NHS Wales aims to ensure that hospital wards in the country have enough qualified nurses to care holistically for patients under the new legislation. The Nurse Staffing Levels (Wales) Act 2016 must be implemented in adult acute medical and surgical wards by next April. It will eventually be extended to areas including health visiting, district nursing and care homes. The guidance stipulates that staffing levels should be planned by a senior registered nurse using a combination of professional judgement, workforce planning tools, quality indicators and patient acuity. There should be sufficient staff to meet the holistic needs of the patient, including ‘social, psychological, spiritual and physical requirements’, it says. Aspects that may influence the ratio include the skills and experience of the staff, the number of temporary nurses, the layout of the unit, such as if there are a lot of single rooms, the number of students that need support and bed occupancy rates. Once the nurse staffing level is established it must be increased by 26.9% – called an ‘uplift’ – to ensure sufficient numbers to cover absences such as holidays and maternity and sick leave. The guidance also makes clear that ward sisters, charge nurses and students should be supernumerary and not included on the roster. The level must be calculated at least every six months, and data on staffing levels on each ward must be presented to the board at least annually, the guidance states. 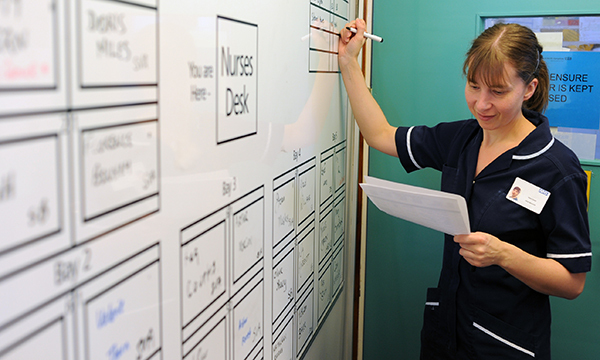 Research has repeatedly shown that ward-based registered nurse staffing is significantly associated with reduced mortality. But the guidance comes as concerns escalate about insufficient numbers of nurses. 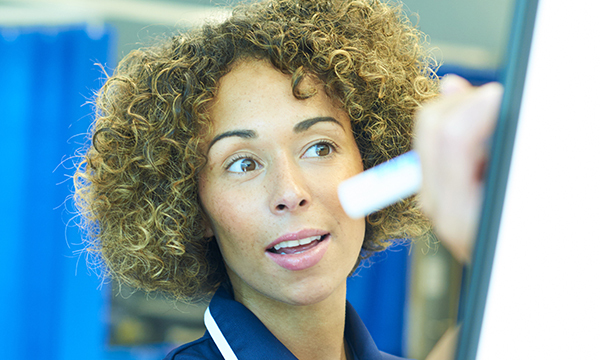 In September, the RCN published the results of a survey of 30,000 nurses, which revealed that sufficient and safe staffing is the exception rather than the rule. Almost six out of ten NHS nurses said their team was down at least one registered nurse on their previous shift, more than half said care was compromised and 44% said no action was taken when concerns about staffing were raised. RCN Wales welcomes the guidance, but is disappointed that it does not include a reference to a ratio of one nurse to seven patients. This figure was set out in the All Wales Nursing Staffing Principles issued by Professor White to health boards in 2012. RCN Wales associate director for employment relations Helen Whyley says it is good news that the ‘designated person’ who will calculate staffing levels must be a very senior nurse or midwife, such as the executive director of nursing. Cardiff and Vale University Health Board executive nurse director Ruth Walker, who represented nursing directors and the chief nursing officer in the development of the guidance, says it is ‘exciting and challenging’. Recruiting registered nurses is currently difficult in many areas of Wales, but she hopes the data the new law brings will ultimately improve the current boom and bust of workforce planning. It is still unclear what will happen to health boards that do not meet the necessary staffing ratios. The guidance says ‘reasonable steps’ must be taken to maintain sufficient numbers of nurses at national and local health board level, and that there should be a system to record and review when a ward has deviated from the planned roster. To maintain staffing levels, boards should be implementing well-being and retention plans and actively recruiting in a timely manner. The Scottish Government is developing a law on safe staffing, following a commitment made by first minister Nicola Sturgeon at RCN congress in Glasgow in 2016. The government launched a consultation in April and a bill is expected shortly. In England and Northern Ireland there is no legislation on nurse staffing levels, though NHS Improvement published a consultation this week on safe staffing in urgent and emergency care in England. The document, which it calls a draft resource, makes recommendations for developing models of care, staffing, tools and monitoring, as well as acting on staffing issues and risk. But it falls short of recommending specific overall nurse-patient ratios.